Our journey has been long. If you know our story from the beginning you know the whole truth of it. What I'm referring to is our trip across the country and oh what a long journey it was. We didn't have a single fight or issue the whole time surprisingly. It was a 1,700+ mile drive just to get to our home and a total of 2,090 to complete the mission. 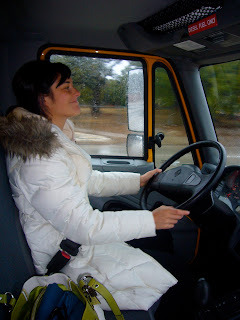 I was the first to drive the beast of a truck! We flew back into Toronto from Jamaica where we got married on January 6, 2011. We drove to Sarnia (yes I also think of Narnia every time I say it) that same night (1 1/2 hour drive). We did laundry Friday, then flew out of Detroit at 6:30am (!!) on Saturday. Yes, we had to get up at 2:30am to get there on time. They are great little travelers. We made it to Wasaga Beach exhausted, but enthusiastic that we were almost done. Michael's friend from church Pierre came over to help unpack. What a God send! I was inside taking the boxes that they unloaded, which was quite a feat. Once the unpacking of the truck was complete Michael and I were piles of mush. 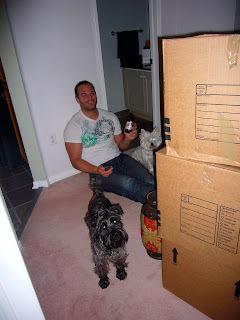 To celebrate the small victory, we went and got much deserved cold adult beverages and pretty much sacked out on the floor among the mountains of boxes around the house. A Red Stripe to celebrate the end of unpacking. Very appropriate considering we just came back from Jamaica! Once the truck was unloaded, we had to drive it to Port Huron, MI (4 hour drive one way) because it had to be returned in the States. Awesome. So, another 8 hour round trip completed our journey. Ever since I have been unpacking, organizing, and cleaning. It's exciting, but exhausting. Worth it? You bet....to have a place to call home. Priceless. Do any of you have a moving adventure to share? Oh my goodness, what a journey!! It was exhausting just reading about it ;) Love the updates! It was exhausting doing it. Glad you're enjoying Sierra!